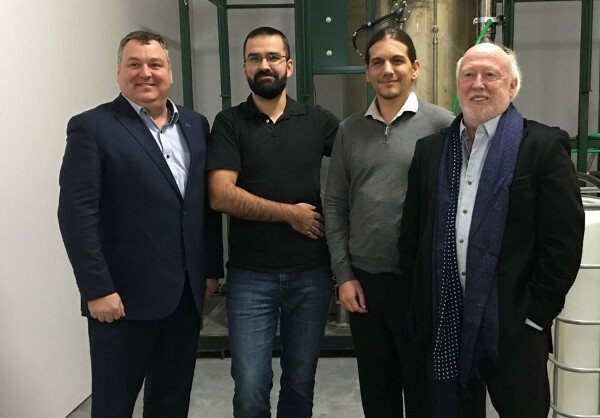 On Friday January 4th 2019, M. François Jacques, member of Quebec Parliament for the CAQ has made a visit with his entourage at the ReSolve Energy’s installation in St-Romain to gather some information about the company’s technology allowing the simultaneous production of solid and liquid biofuels. It was a great opporunity for the BTL and its partner to start the year of a good note by meeting with the political leaders of the region. On the picture (from left to right) : Mr. François Jacques (CAQ), Pr Jean-Michel Lavoie (BTL), Dr Xavier Duret (ReSolve Energy Inc.) and M. André Proulx (ReSolve Energy Inc.).